Offer consistent, high-quality service each and every time. What’s the point of a great message if it can’t be replicated across your entire contact center? Regardless of the situation, client, or initiative, guide your agents to provide consistent, high-quality service during every customer interaction with 3CLogic’s real-time dynamic scripting engine. Accuracy, uniformity, and quality each and every time. Want a unified customer experience? Build any script to fit your exact needs. 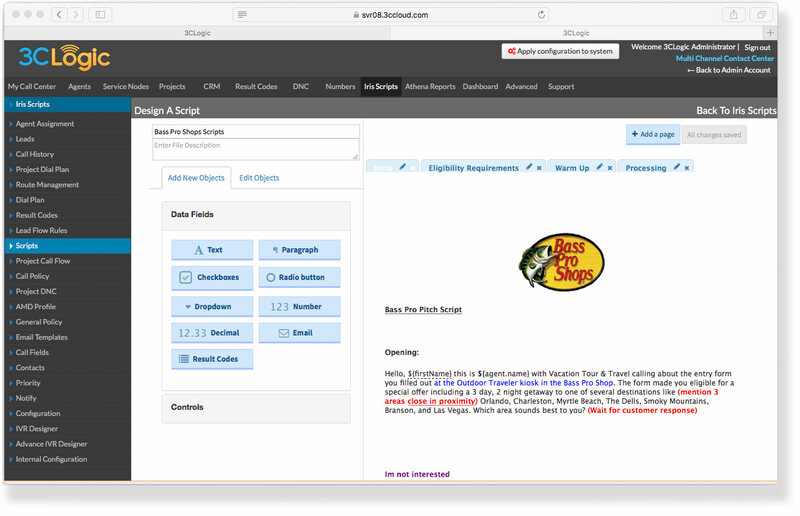 3CLogic’s powerful scripting engine empowers supervisors to fully modify codes and sync scripts with any database management system (CRM, WFM, or Ticketing system) to create personalized, data-driven interactions. Create, edit, and update dynamic scripts in real-time, keeping agents aware of any changes to company goals, initiatives, and needs without impacting the daily workflow. Easily create uniquely catered scripts for any scenario with 3CLogic’s dynamic branching, providing the right decision matrix for agents to follow during any call. Whether your agents are new or seasoned, your processes existing or just getting started, ensure every customer interaction goes exactly how you want it to. With the ability to create, edit, and update time, offer guidance to every rep in any situation. With 3CLogic’s dynamic scripting tool, guide reps seamlessly in real-time through every client interaction while successfully addressing each customer inquiry on the first go-around. The right scripting solution can increase agent productivity by as much as 36%! Stay ahead of customer needs with real-time agent prompts driving the customer experience while meeting company goals and initiatives. With 3CLogic’s dynamic scripting engine, uncover, alert, and guide reps through any additional sales opportunities in real-time when it counts – during the customer interaction. Ensure compliance with company and industry standards with step-by-step agent fields guiding customer service representatives throughout every interaction.